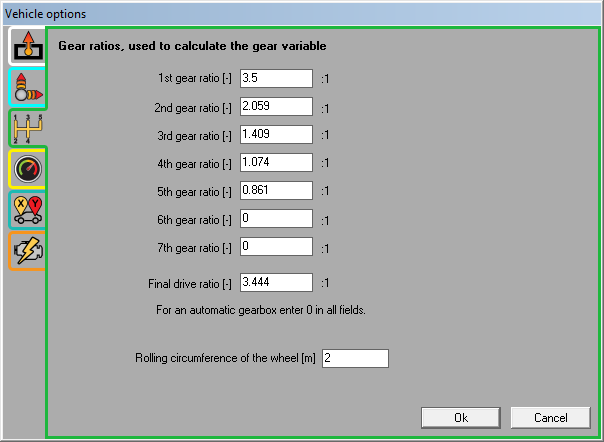 Entering the gear ratios for the vehicle will enable the software to calculate which gear the vehicle is in at any given speed, by combining the vehicle speed, gearing, and engine speed information. To find the gearbox gear ratios, and the final drive (differential) ratio, you may need to look in your vehicle operation manual, or use the internet to search for the information. If the vehicle is fitted with an automatic gearbox, enter 0 in all fields. For any gears which are not present on the vehicle, enter 0. This would apply to gears 5, 6, and 7 on a four speed gearbox. The Rolling Circumference Of The wheel is just the distance it takes for the wheel to do one complete revolution while in contact with the floor.